Site Stewards: Huachucha Audubon Society and Birdland Ranch in Algerita Canyon on the west side and The Nature Conservancy Ramsey Canyon Preserve on the east side. Visiting the IBA: To reach the most popular birding sites in the Huachucas, you must go through Fort Huachuca. Please note that everyone in the car must have a valid ID and your car must have current registration and insurance. Enter Fort Huachuca from Sierra Vista. Follow south on the main road 9.5 miles to Garden Canyon as indicated by the signs. For the more adventuresome, Lyle and Sunnyside Canyons on the west side are wonderful birding destinations accessible from the Parker Canyon road south of Sonoita. Directions to other birding sites in this range can be found in Finding Birds in SE Arizona. Ownership: Coronado National Forest and Fort Huachucha (Permission Only) and Private (Permission Only). Site Description: Four major peaks dominate the 20-mile long mountain range; Miller Peak (9,466 ft), Carr (9,220 ft), Ramsey (8,725 ft), and Huachuca Peak (8,410 ft). The highest elevations are mixed conifer forests dominated by Chihuahua Pine. The lower slopes are Madrean Oak woodlands and savannahs and the riparian canyons are populated with large Sycamore, Arizona Ash and Alder trees mixed with large live oaks, alligator juniper, and pine. Birds: The Huachuca Mountains support an incredible number of avian “species of conservation concern”, some of which are found only in the United States in the border “Sky Island” mountain ranges of southeastern Arizona. A particularly unique feature of this range is the convergence of Rocky Mountain and Sierra Madrean bird populations, for example Virginia’s and Blackthroated Gray Warblers of the interior Rocky Mountains and Red-faced and Olive Warblers of the Sierra Madres both occurring in the IBA and the co-occurrence of nesting Eastern and the Western Bluebird. Part of this IBA is within the Ramsey Canyon Christmas Bird Count circle. Year-round: Wild Turkey (Gould’s race), Scaled Quail, Montezuma Quail, Prairie Falcon, Peregrine Falcon, Mexican Spotted Owl, Whiskered Screech-Owl, Arizona Woodpecker, Mexican Jay, Yellow-eyed Junco, Black-chinned Sparrow, Abert’s Towhee, Eastern Meadowlark, and Pyrrhuloxia. Site Description: Four major peaks dominate the 20-mile long mountain range. Situated on a diagonal axis, these peaks from the southeast are: Miller Peak (9,466 ft), Carr (9,220 ft), Ramsey (8,725 ft), and Huachuca Peak (8,410 ft). Rainfall along the crest of the range averages 30 inches per year, and temperatures are 20-25 degrees cooler that the San Pedro valley floor. 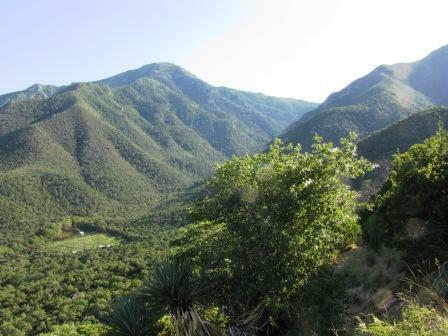 The Huachuca Mountains have the most perennial streams (6) than any of the other Madrean mountains in Arizona. A substantial portion of Fort Huachuca is within this IBA. The southern portion of the IBA is the Coronado National Monument, and the mountains slope southward into Mexico. On the western flanks are a few ranches and private dwellings. The IBA boundary is the Huachuca Mountains 5,000 feet and above in elevation. Access to Fort Huachuca is restricted. Contact the fort for access rules and permits. The Huachuca Mountains support an incredible number of populations of avian “species of conservation concern” (26), some of which are found only in the United States in the border “Sky Island” mountain ranges of southeastern Arizona (Buff-breasted Flycatcher, Whiskered Screech-Owl, and Elegant Trogon). Also found in the Huachuca range are rare neo-tropical species found only in the most southern Sky Island Mountains of Arizona (e.g., the Berryline Hummingbird, Blue-throated, Violet-crowned, and White-eared Hummingbirds, Sulphur-bellied Flycatcher, and Buff-collared Nightjar). Some species of conservation concern in the Sky Island ranges of Arizona are similarly of conservation concern in Mexico (e.g. Mexican Spotted Owl and Eared Quetzal-an occasional breeder in the Huachuca Mountains). This range supports the largest number of breeding pairs of Elegant Trogon in the United States (~46 pairs) and likely the largest population of Whiskered Screech-Owl in the United States. A particularly unique feature of this range is the convergence of Rocky Mountain and Sierra Madrean bird populations, for example Virginia’s and Black-throated Gray Warblers of the interior Rocky Mountains and Red-faced and Olive Warblers of the Sierra Madres, occurring in different habitats of this same mountain range. Wintering Lewis’s Woodpecker and Pinyon Jay and Arizona Woodpecker and Mexican Jay, are another example of this convergence. Conservation Issues: Minor threat exists from spread on invasive non-native plants. Major threat exists from past fire suppression, and a build up of dense fuels, particularly in the pine-oak, ponderosa pine and Douglas fir habitat zones. A localized major threat is heavy grazing by cattle on the western slopes and northern slopes of the range, particularly grazing in riparian habitat within canyons. Light to moderate grazing outside of riparian habitats is of minor influence within the oak-grassland habitat type. Localized site stewards are Birdland Ranch in Algerita Canyon on the west side and The Nature Conservancy Ramsey Canyon Preserveon the east side.